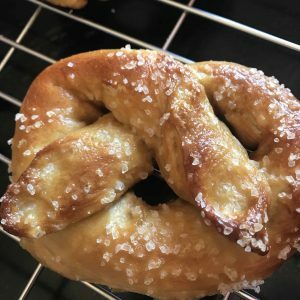 These soft and chewy pretzels are easy to make and are delicious! You’ve probably got all the ingredients in your pantry-flour, baking soda, salt-that’s it! This recipe makes 8 palm-size pretzels. 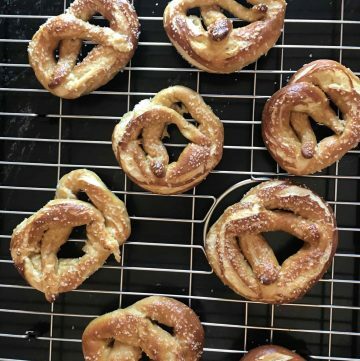 Soft, chewy pretzels are so easy to make, and an excellent vessel for your favorite dip! NOTE: use a thermometer to test the temperature of the water; it MUST be between 110ºF - 115ºF. Form a "U" with the strand of dough, then, holding each end, bring it down to the base of the "U". Lightly pinch where the strands cross and where they meet at the base of the "U"
Form pretzel balls! Just roll the dough into bite size portions, boil for 30 seconds, place on sheet, and continue process. Americans generally dip pretzels in mustard, but the Germans and Austrians dipped them in melted butter! Dip them in the sauce of your choice, mustard, butter, hummus, peanut butter, chocolate!! !